If you are looking to hire a professional roof cleaning company in Exeter or Devon, Bishop's Exterior Cleaning are the company to call. Our residential and commercial roof cleaning teams, operating throughout Exeter and Devon have a fantastic reputation for providing a superb service and at gaining exceptional roof cleaning results for our customers. Give us a call on either 01626 798 188 or 07938 377 547 to find out more about our roof cleaning services. Residential roof cleaning services in Exeter and throughout Devon. Commercial roof cleaning services in Exeter and throughout Devon. Are you looking for a professional roof cleaning company in Exeter or Devon? 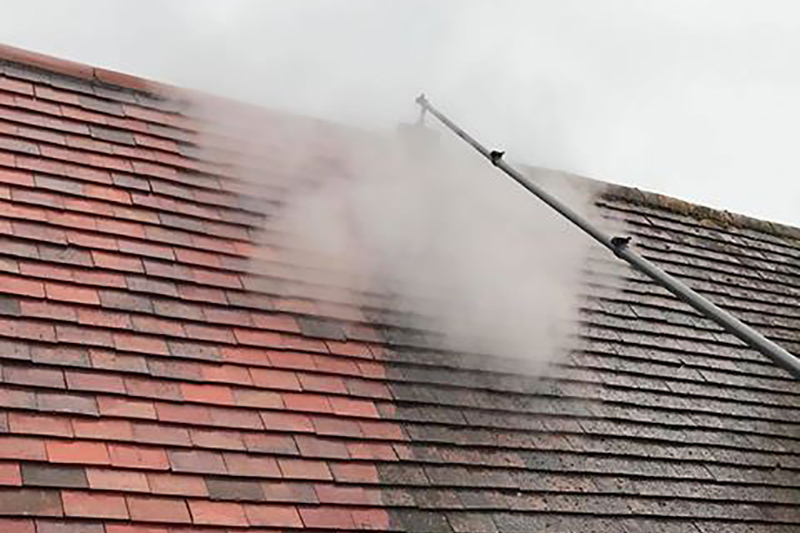 Our roof cleaners in Exeter have been cleaning roofs for our residential and commercial customers for many years now and have a vast amount of experience and industry knowledge when it comes to cleaning all types of roofs. If you constantly have moss falling from your roof, which also may be blocking your gutters and falling on your patio or driveway then we are here to help! Our roof cleaners in Exeter will firstly clear your roof from all debris, including moss and other forms of roof build-up, making sure everything that can be removed before cleaning is removed. They will then proceed to thoroughly clean the surface of your roof, making sure any organic matter, dirt, grime and other pollutants are cleaned off. You will be amazed to see the results we are able to achieve. If you are looking for the best roof cleaning company in Exeter, Devon, look no further that Bishop's Exterior Cleaning.